For those born February 10, 1981. 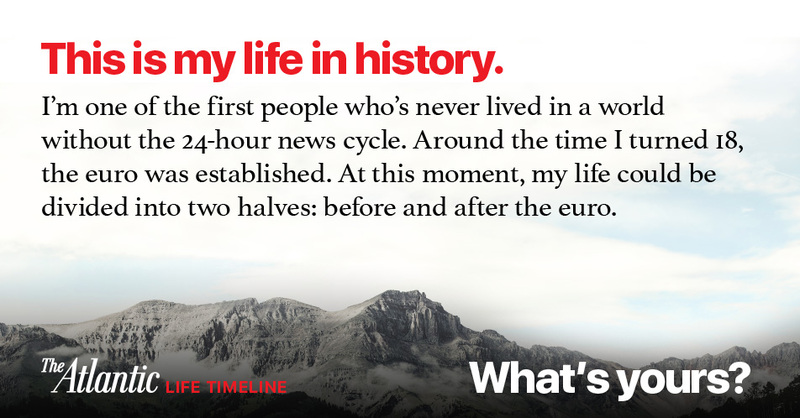 You're one of the first people who's never lived in a world without the 24-hour news cycle. In October 2009, Mark Bowden wrote about the toll of constant coverage. Around the time you were born, President Ronald Reagan survived an assassination attempt and gunshot wound. In April 2001, Richard V. Allen published transcripts from the White House Situation Room after Ronald Reagan was shot. You were born in February of 1981. This year, The Atlantic celebrates its 160th birthday, making it 4 times as old as you. The year you were born, William Greider wrote about the incoming budget director's experiences working in the Congressional Budget Office, in a revealing article which set off a firestorm of controversy in and around the Reagan administration. At 8 years old, you saw the collapse of the Berlin Wall. My So-Called Life premiered in 1994. Around your 18th birthday, the euro was established. In November 1999, Robert Levin wrote about the role of the new euro. When you turned 29, you saw the rise of the Arab Spring. In 2016, Serena Williams, who was born the same year as you, won her 22nd Grand Slam title at Wimbledon, tying Steffi Graf for the most major championships in the Open era of professional tennis. She went on to break that record the following year, when she secured her 23rd title. In July 2016, Vann Newkirk II wrote about the significance of William's win and her position as one of the greatest athletes of all time. By the time you turn 39, scientists estimate it will no longer be possible to keep global temperatures from rising at least 1.5 degrees Celsius.